It and All comes from within. We can explore that space. Mari was born in Nara, in the South of Japan, and grew up in Aichi. She had always been made curious by the idea of exploration, especially the kind that affords one the journey or experience of finding oneself under the circumstances of yet known places and people. This desire reached it's peak when she moved to the city of New York in the year 2007. 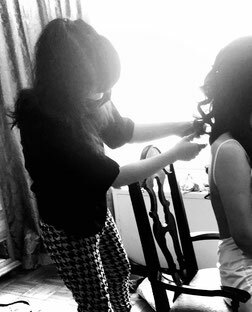 At this time, she had been working as a hair stylist for already 7 years. Her practices upon moving to the city expanded in ways she had not expected, from the warm familiarity of the salon to new personal clients from across the World that would enter her life in coincidental ways, to special projects for fashion and film productions. Mari had always found the experience of working with one's hair to be an especially intimate one and amongst all of these avenues of her trade, she would constantly notice some fundamental relation being the necessity and powerful feeling of fulfillment by human connection. It had always been of Mari's interest and importance the feeling of connection to oneself, and the methods one may employ and explore to achieve this sensation. Though she would now begin to see the greater purpose of this essential human need and it's beautiful reliance as well on one's feelings of connection with and to others. By way of her work with hair, Mari discovered the very powerful feeling of joy she received from sharing with others, which had been clearly intertwined with the nurturing and caring she felt open and able to provide for them. She had reached the point in her life where she realised that human connection was much more than what it had always seemed to be or mean, and this reflection led her back to the idea of the self - and more personally even, her very own self. Mari identified the self in a suddenly different way than before. She understood the core human need as satisfaction or happiness, and specifically a satisfaction with oneself. She realised that human connection with others could only be made possible in a genuine way by means of connecting with oneself - by reaching inward and revealing one's psyche to oneself, and absolutely for the purpose and sake of healing. Her intrigue in healing grew from this point on. Studying intensely various philosophies and healing methods, Mari began to feel a deeper purpose for herself and in her life. It was as though all around her began to validate her newfound realisation, a seeming string of coincidental events, which she found most odd and therefore surely wonderful at the same time. She began to find that the seeking and healing of oneself, for the sake of living truly and with content, led the individual ultimately to nature, and one's relation to it - the 'way', or working of the World, one's psyche/soul, and the inevitability of human connection. It is in this humble journey as an individual, constantly expansive and far-reaching, that Mari wishes to share and grow with others. It is of her greatest pleasure the encouragement and support from that of her friends, family, colleagues, and those that she has crossed paths with. She is of appreciation and shall remain so. Thank you to you all.